Sean Carlos was born and raised on the Big Island of Hawai‘i. He graduated from Kealakehe High School in 2010, and then continued his studies at UH Hilo. He is currently majoring in Computer Science and expects to graduate in Spring 2015. After earning his B.S. 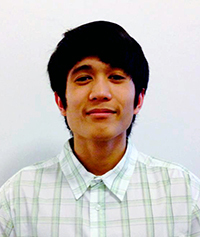 degree, he plans to pursue a career involving video game development. In his free time, Sean likes to lift weights, breakdance, play video games, and jam out on his ukulele. Project Abstract: We are developing a prototype Web-based graphical user interface (GUI) that is able to display real-time telemetry data from the telescope’s adaptive optics real-time controller. The sample telemetry data include deformable mirror actuator commands and laser guide-star wavefront sensor gradient measurements. The GUI will be composed of two components: the “back-end” will receive a data stream from an actual or simulated source, and send it through a Web socket in real time to the users’ browser; the “front-end” will be running in the users’ browser, and will display the real-time data at a speed of around 30 Hz. The end-users of the GUI include engineers at TMT who will monitor the adaptive optics real-time control process for optimal scientific data collection. They will be able to examine the data through zooming, panning, and pausing features, to quickly visualize any unusual behavior of the deformable mirrors in real time. This GUI can be expanded further by adding more features to the user interface, such as a database to access recently collected data.